One thing to watch out for in fossil specimens is the spectre of distortion. While most people are probably comfortable with the idea that obviously not all fossils are complete and bits are often missing, they can suffer other kinds of damage. Fossilisation does, after all, largely require that bones be buried under millions of tons of sediment for millions of years and so it should not be a surprise that tough though bones (or fossilised bones) are, the Earth has the capacity to affect them. In other words, a bone might be buried in pristine condition, but that doesn’t mean it will come out in pristine condition. First off it might simply be crushed – something of course particularly seen in lagerstaat specimens like those from Liaoning or the Solnhofen. These are certainly crushed, but the crushing need not change the bones, or rather, that shapes of those bones. Pretty much all of this Archaeopteryx is effectively flat, whereas the bones were not 2D in life, so rather by definition the specimen is crushed. 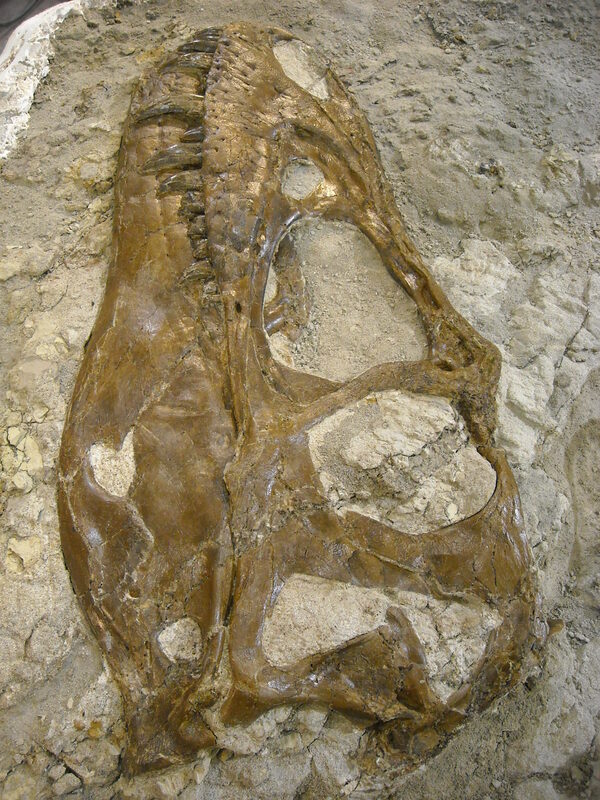 However, it’s pretty clear that the arm bones have retained their original shape – as if a photo was taken of them, but the skull is rather crushed with parts broken and moved. Think of a drinks can. Take a look at the end. Now stamp on the can to flatten it and look at the end again. If you did it right, it will still look more or less the same, despite the obviously catastrophic crushing the can as a whole has suffered. From the point of view of a palaeontologist, it’s not so bad. Sure you can only see one end of the can, but what you can see is actually a pretty accurate representation of what it looked like before your foot got involved. So much so straightforward, but often unmentioned is that things can be distorted too. Not broken or crushed necessarily, but simply shifted. To continue our can metaphor you can flatten it on it’s side but what is like to happen is for it to flatten out and look much fatter than it was originally. And that what were the sides (OK, it’s a cylinder, but bear with me) are now visible to the left and right of the front. Or if it went sideways a bit, the front could lie to one side. These are generally easy to spot as the bones end up looking super fat with small articular ends. You can also crush the can upwards such that the base of your now 2D representation of a can had the base covering most of the face. Finally the whole thing might remain in 3D but still shifted slightly from its true form. One face could be folder over, or crushed in. It might have moved like a parallelogram as it were with the top and bottom staying parallel to each other, but no longer one directly above the other. All of this can and does happen to fossils. Sometimes, even most of the time, it’s very obvious. But some can be quite insidious and hard to spot, or it may not be clear which side has been distorted and which is the original. The surrounding matrix can be very informative in this respect, but of course what is usually the most helpful in these situations it to get multiple specimens. Even if they are all crushed, these will be in different ways with different levels of distortion and working out what bits when wrong where can become much clearer. Still it’s another issue to be wary of and of course another potential source of both error and disagreements between researchers. Ah the joys of geology. This gig would be much easier if we had proper dead dinosaurs to work from and not these scraps of modified bone and rock. Still, there’s always the possibility a couple of rexes will stumble through a time portal at some point. I can live in hope, though in the meantime, we’re not short of fossils. 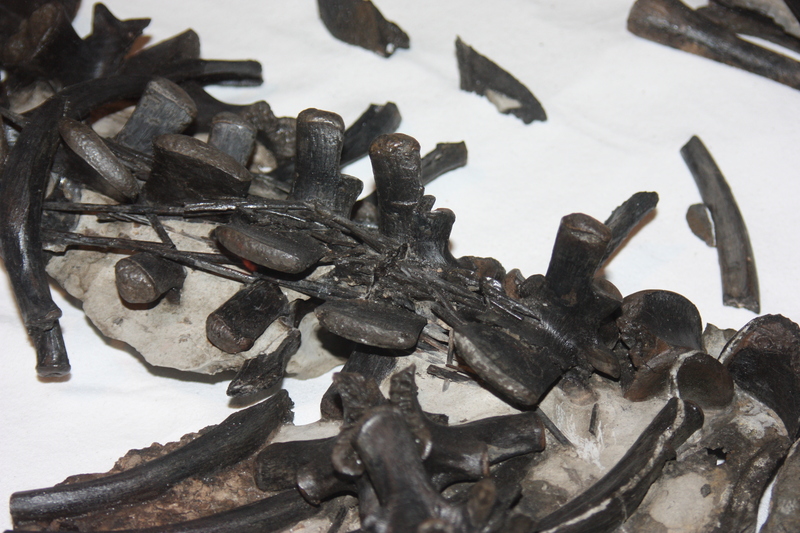 The wonderful and articulated specimen of Scelidosaurs that I showed the other day went down very well. Such specimens do of course provide amazing information about the anatomy of the animal but the downside of this is that a lot of information is present *in* the position of the bones. That means you don’t really want to prepare the bones free of the matrix entirely but that then you can’t see them from every angle and get to every detail. There are ways around this of course from CT scans, to simply casting the specimen to create a record and then preparing the specimen fully. The other ‘solution’ such as it is, is simply to get hold of some other specimens. 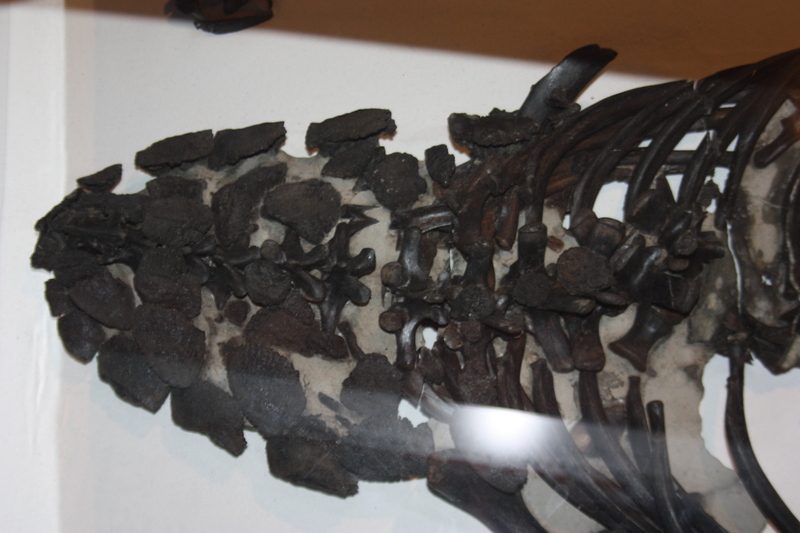 Here as promised then are some separate Scelidosaurus bits from the same exhibit in Bristol, enjoy. 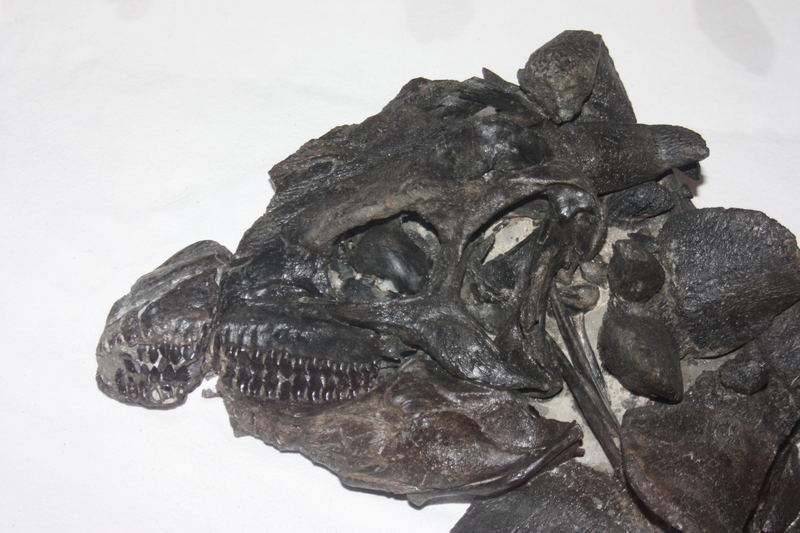 The Gorgosaurus skull (left side) was finished on January 27th. A very close visual inspection was made over the entire skull and any remaining bits of bone-colored glue, rock or sand grains removed with a scalpel carrying a #15 blade which I reshaped to suit my requirements on an oilstone and resharpened every 10 minutes or so. A finger was then run over the the entire specimen. Any bumps, pointy bits, or rough patches were reinvestigated to comfirm they were actually bone. If not they were removed. Then a magnet was passed over the entire specimen and surrounding matrix. Magnets are not in a standard preparators toolbox but I use one at the end of each project. Several types of small wire brushes were used to carefully clean the bone surface over the past months and they do shed bristles, some quite tiny (2 mm). 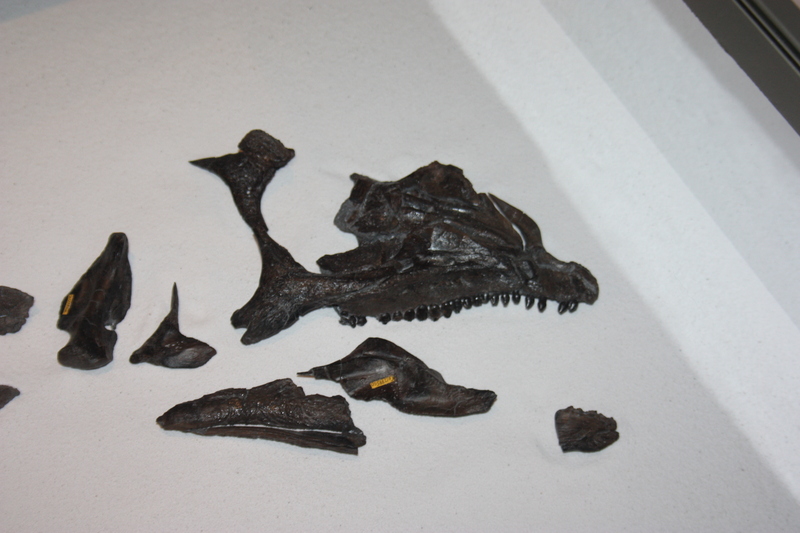 This specimen is to be CT-scanned by researchers in the next few months. I don’t want them coming back to me saying some foreign metal object compromised their CT-scan results. While I have kept the Gorgosaurus skull clean by brushing and careful vacuuming, I was still able to get about half a dozen metal brush bristles with the magnet. I then washed the skull with tapwater and a standard toothbrush with firm bristles. The brush was made wet, then vigorously shaken out so it was only damp, not dripping wet. 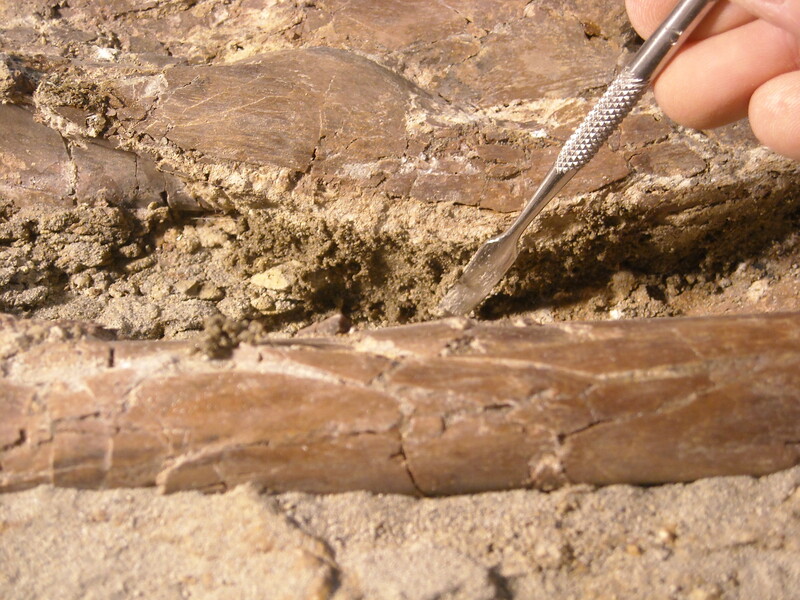 The bone surface was carefully scrubbed in a circular motion. The brush was then rinsed out in a clear container of tapwater. Each time the brush was rinsed this way, it was easy to see the water becoming more and more dirty as more of the clay particles and other minerals were removed from the bone surface. When the brush rinsed clean after each scrub it was time to stop. Then the skull was put under a desklamp with a floodlight bulb to warm up and evaporate any remaining water. The skull was then allowed to sit for an hour and cool down. This is important for the next step. A heated specimen, having more glue added to it, can have the acetone solvent “boil”, ruining the effect one is now trying to achieve. A thin mnix of Acryloid glue and acetone was mixed and a thin layer brushed over the specimen and “scrubbed” into the bone with tight circular motions so it soaked in deeply. This glue seals any microcracks and holes. This is vitally important as the specimen is to be latex molded soon. Latex, being brushed on, gets into every nook and cranny. It can be pushed through a crack where it can expand a bit. When the cured latex is removed, the expanded bits of latex “grab” onto or anchor into the bone and require more force to pull out. This pulling action can damage the area involved and compromise the safety of the entire specimen. So it is best to seal over these potential problem areas now, rather than deal with breakage later. However, it is almost always inevitable that some breakage occurs during demolding. Once the entire skull and teeth were so treated and the glue dried within minutes, I was able to step back and get that feeling of a job well done, that every preparator experiences at the end of a project (in this case the skull only)I. I still need to finish off parts of the legs and ribs before molding happens. A molding meeting is happening the middle of next week to discuss how the molding/demolding will proceed. Hopefully in about 2-3 weeks the molding will begin- that process taking about 5 days. [Dave adds: And now, here it is. 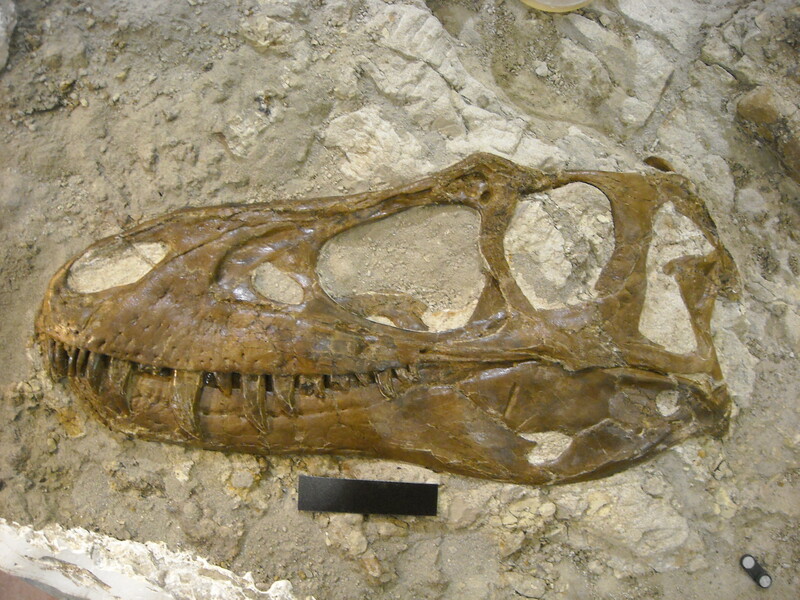 The complete and final and finished version of the left side of the skull. Scale bar is 10 cm. And just a couple of months ago it still looked like this]. Having recently covered Hyleosaurus it’s high time I dug out my post on Scelidosaurus and got that out. While pretty much everyone has a decent handle on the general appearance of the stegosaurs and the ankylosaurs, their collective forerunners, the basal thyrophoreans, are rather less well known. Looking (to me at least) a bit like a combination of the two – slightly squat stegosaur-like bodies without the high hips but with smaller plates and scutes and not the totally squat and super armoured body of the ankylosaurs. These are, like many slightly obscure dinosaur groups, starting to get more attention and in the case of Scelidosuaurs this is certainly bolstered by the presence of several amazing specimens. This one was photographed at the Bristol Museum and, as I understand, it is privately owned and on loan. I have heard through the grapevine that the ownership of this is contested and that several museums have tried and failed to purchase this as a result [Edit: I’ve just heard from Matt Williams in Bath who tells me this is quite wrong. Apologies. Still, that’s what rumours get you]. The truth is somewhat since it is on public display and has featured in at least a couple of books though to my knowledge it hasn’t yet cropped up in the formal scientific literature. What’s so great about it is that not only is the specimen pretty much complete and articulated but so too is all the armour. Pretty much every scute and spike likes where it would have appeared in life and can be clearly seen that there are whole rows of these lying across the specimen in pretty neat patterns. Obviously in many thyrophorean specimens these small (or even big) pieces of bone can move around or be found isolated from the skeleton so this kind of specimen provides incredible information about where which pieces go and can really help inform the restoration of other specimens and even other taxa. (Oh and look out for some nice ossified tendons too). 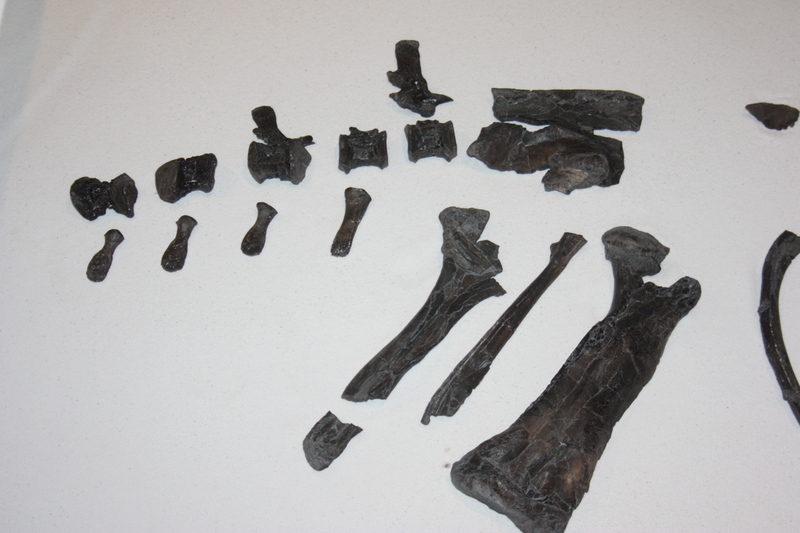 If there is one problem here, it is that the bones are black and shiny and in a brightly lit case that means these photos are not as good as I would like, but hopefully this all looks pretty good. (Late edit: Darren Niash has a picture of the whole thing here). There are also some nice isolated elements in addition to this main specimen so I’ll be running another post soon with a few more close ups and bits. I’ve commented before on the slow and painful death of taxonomy in science and the issues this is likely to bring in the long run. Fortunately it seems that this is finally starting to be picked up in the wider world and that this may get a little attention. Case in point being this rather good article on the subject which I can highly recommend (thanks to Taissa Rodrigues for flagging it up). The only thing I’d add is that they seem to have overlooked what, for me, is the biggest problem. Species are inherently hard to identify and sort out properly. And so while an absence of taxonomists does mean we can loose species without knowing they exist or have real problems understanding biodiversity and conservation, the real issue is far more fundamental. If you do not know what a given species is, or it is not defined properly then *any* research based on that in any way is fundamentally undermined. You simply can’t practice biological research effectively if your most basic unit of study is questionable. Try doing a phylogenetic or ecological analysis when it’s not certain which specimens in your lab belong to species A or B, or even Q. Taxonomy is the absolute bedrock of biology and without it, the foundations of our research are going to be awfully shaky. Hind limb elements of Linhenykus. From Xu et al., 2011. It’s a new taxon so of course I’m going to try and milk it for a couple of extra posts. Anyway. Linhenykus is represented by most of a skeleton which is always a nice thing to find. However the actual preservation of the specimen is worthy of comment as it contrasts quite sharply with most of the material that is recovered from Bayan Mandahu. While this stuff can be exceptionally nice, it also tends to be quite fragile and prone to eroding down to, well splinters, and eventually, nothing. 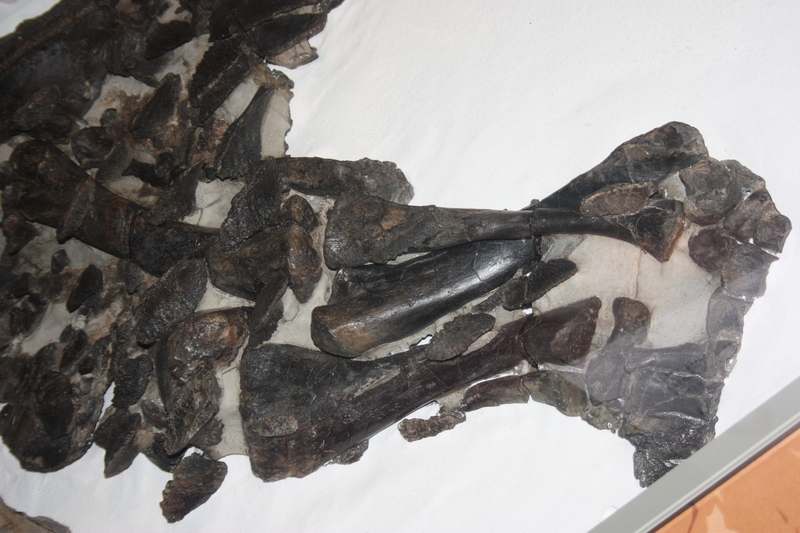 The bones of Linhenykus however are incredibly tough. They were preserved inside a tough nodule and the bones have fossilised rather differently to the vast majority of things at Bayan as a result. (As a side note, I don’t actually know of any other specimens recovered from nodules in these localities, this may well be the first). 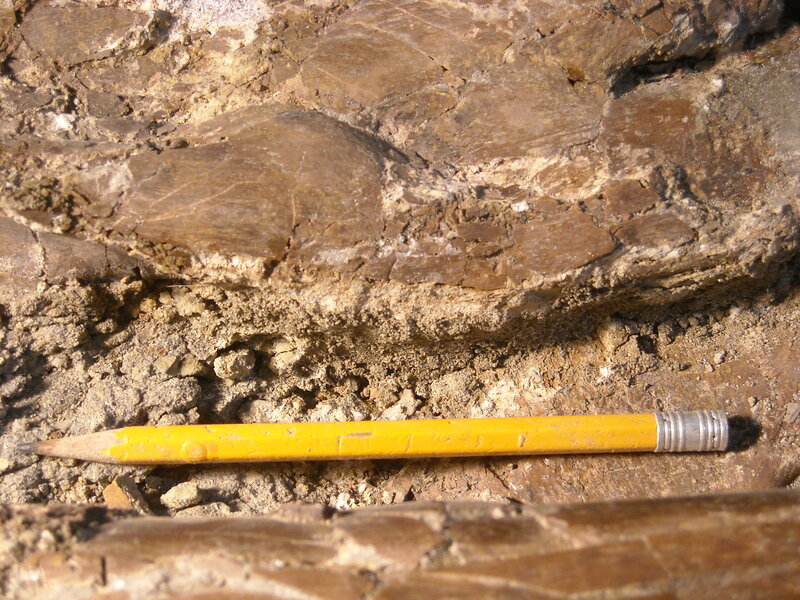 The nodule itself had eroded away and the bones were found left on the surface. Obviously it’s impossible to know how long they had been there, but aside from a few breaks the bones were in amazing condition and required effectively no preparation. They must have been out there for some time to have eroded completely free of any matrix yet were undamaged showing just how tough they are. It perhaps also explains why we found so many small elements in such great condition (like the vertebrae and that tiny metacarpal). Being so tough and resistant to erosion meant these otherwise vulnerable details and bits of bone were never really troubled by weathering and survived intact. Which was nice. If i was more of a taphonomist I’d be expanding on this at some length, but since I’m not, I’ll be stopping here rather abruptly. One thing that Linhenykus does demonstrate well is that fact that even very well studied and excavated areas can still yield new species. Obviously there are dinosaur localities that have had far greater attention than Bayan Mandahu, where this little guy heralds from, and show similar patterns of new discoveries and new taxa. Part of this of course is that old collections get reassessed and long buried specimens turn out to be something new and interesting but merely previously overlooked. 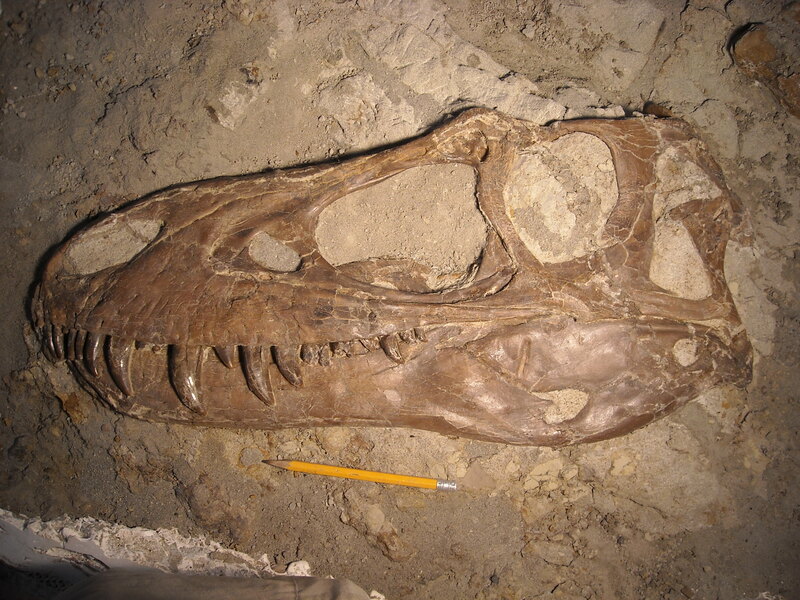 In this case though despite years of collecting at Bayan, by multiple long expeditions, often well manned and with lots of real specialists, we have clearly not got a complete breakdown of the dinosaurs there, and indeed there could be a lot more to find. Obviously we have great representatives of the more common material (not least Protoceratops) and there will likely be diminishing returns, but there is more to find. I’d not be surprised if there were another dozen more genera out there to turn up in the next few years and even more after that. 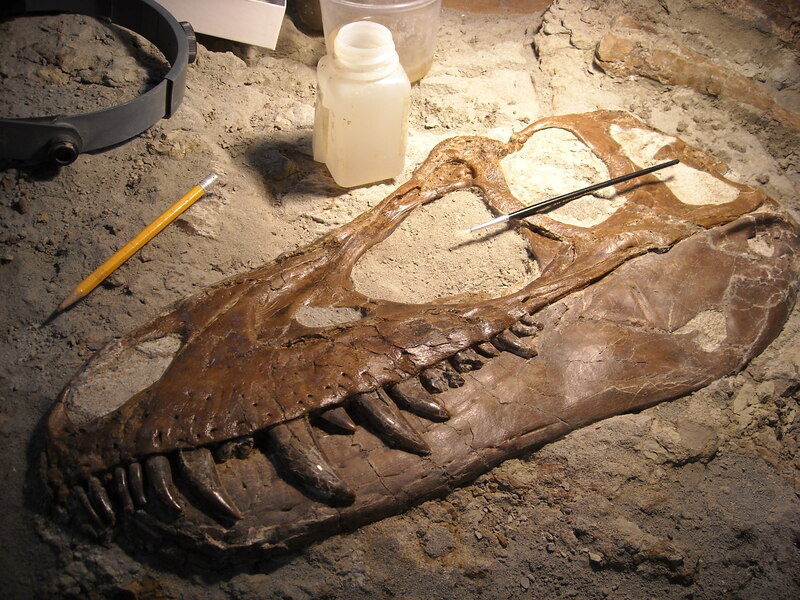 The fact that even century plus old localities are turning up new and surprising taxa shows how far we have to go with dinosaur diversity and that it’s not just about finding new places to dig. The oldies are still goodies. Linhenykus: the very model of modern Mongol, errr, alvarezsaur. Yep it’s another new paper and another new alvarezsaur. Way back when with Xixianykus I mentioned that there were more to come. One of these was Haplocheirus and now Linhenykus is on the scene. As with Linheraptor this was another find by Johan Choiniere when out with Mike Pittman, and as I recall was found just the day before that cracking dromaeosaur. This specimen had eroded out of a nodule, rather unusually for Bayan Mandahu, but the bones were in superb condition and aside from the head and tail, was pretty much complete. It’s a tiny thing, the living animal would probably have been able to sand comfortably in the palm of your hand, but even so it has one rather unusual feature – it has only one finger. Now the mononykines (more properly parvicursorines) the sub-group of alvarezsaurs to which this belongs are, if you know your languages, defined by their single large claw on the hand (mono = one, nykus = claw). But this is in conjunction with either one or two smaller fingers on the hand, not too dissimilar to Cyclopes, the pygmy anteater. 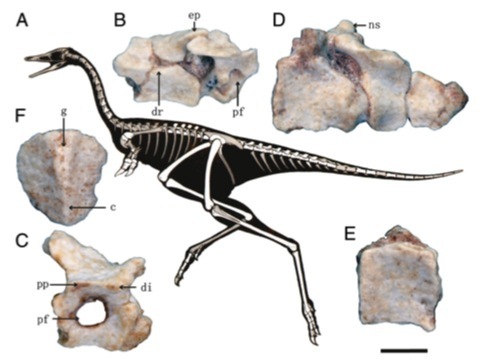 Linhenykus however has just one functional finger, the first non-avian dinosaur known with this feature. There is a second metacarpal (one of the palm bones) preserved, but this has no phalanges attached and indeed tapers to a point distally showing that the hand really didn’t have any other fingers. 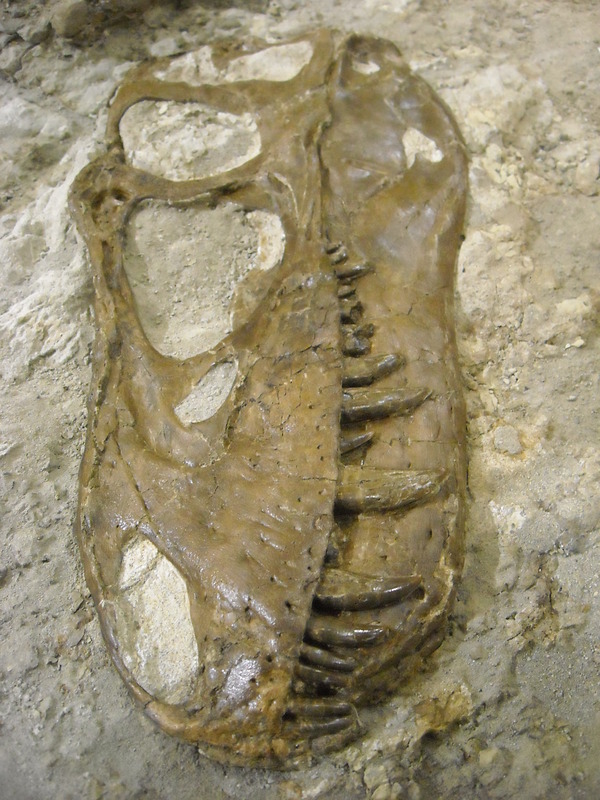 This is a one fingered theropod. Actually the presence of that second metacarpal is rather handy, without it it would be easy to conclude that the rest of the hand was just missing, but being present and in a condition where it would not support any phalanges shows that we do have the whole hand and this was genuinely one fingered. 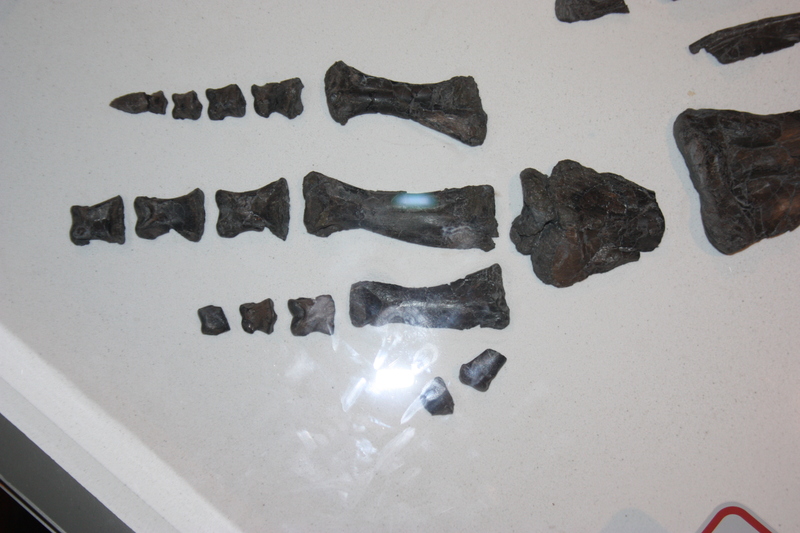 Interestingly, Linhenykus is not an especially derived alvarezsaur despite the obviously highly modified hand even compared to other alvarezsaurs (see the hands and phylogenies image). Its main claw is not as big as later relatives so it is derived in terms of digit reduction but basal in terms of claw development and robusticity. This suggests at least the possibility that the other digits were effectively vestigial in derived alvarezsaurs. If they were non-functional then they would be under neutral selection, they might be lost, or hang around in various lineages and their reduction or loss could be down to nothing more than chance. 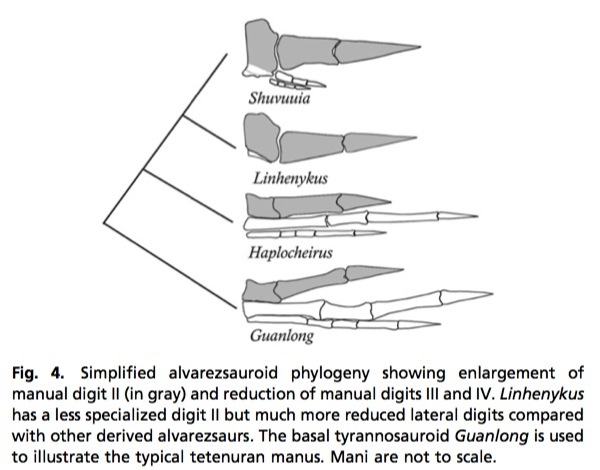 This is of course a working hypothesis and it will be very interesting to see if other alvarezsaurs turn up showing similar variability in the state of their non-specialised digits. Xu, X., Sullivan, C., Pittman, M., Choiniere, J., Hone, D.W.E., Upchurch, P., Tan, Q., Xiao, D., & Lin, T. 2011. 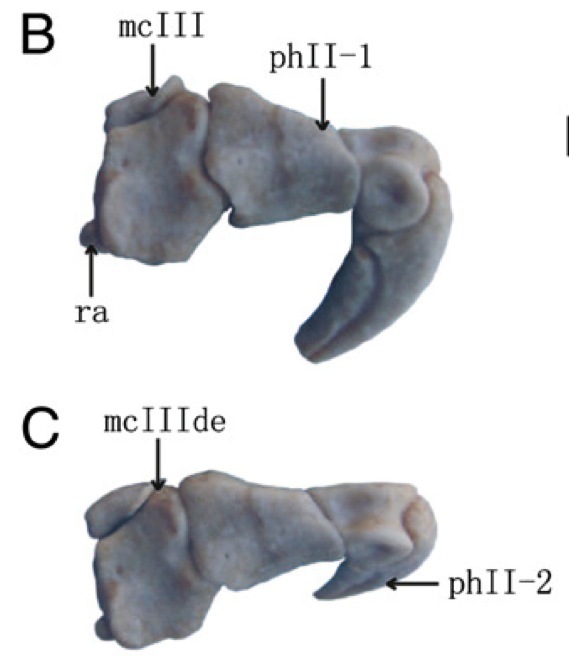 The first known monodactyl non-avian dinosaur and the complex evolution of alvarezsauroid hand. PNAS. in press. One think that often seems to come up in discussions of science or the work of scientists is the idea that we are, well, all like this. There’s the underlying assumption that all we care about and think about is data. Sure, the vast majority of us are nerds and geeks to a greater extent (we are, after all, professional scientists, it’s our *job* to spot errors and know and understand science) but that doesn’t mean that this is all we are, or more importantly, that there is no artistry in science. This for me was brought home by comments on a piece about my UV work. People (understandably) find it hard to adjust to the idea that many theropods were feathered and want their mind’s eye scaly dinos ‘back’. We are to blame for doing, well, science and showing this is not true. OK, so the comments were obviously tongue-in-cheek and no actual criticism was being leveled at the research, but what I find odd is that the scientists themselves are never put in this bracket. *I* find it weird to think of thinks like tyrannosaurs and even oviraptorosaurs and dromaeosaurs with feathers. I find it really, really strange that when I feed the ducks on the canal by my house that these are actually theropods. I *am* feeding dinosaurs. For real. That’s *strange*. I work on dinosaurs and feathers and the transition to birds and it still regularly fries my brain that there are dinosaurs everywhere I look flitting from tree to tree. In short yeah, we are scientists. But trite and obvious though this is to my audience here, we are people too. And there can be some real art and poetry in science from awesome looking photographs to beautifully crafted taxonomic names and descriptions. I just wish a few non-scientists would credit us with not being automatons on occasion. 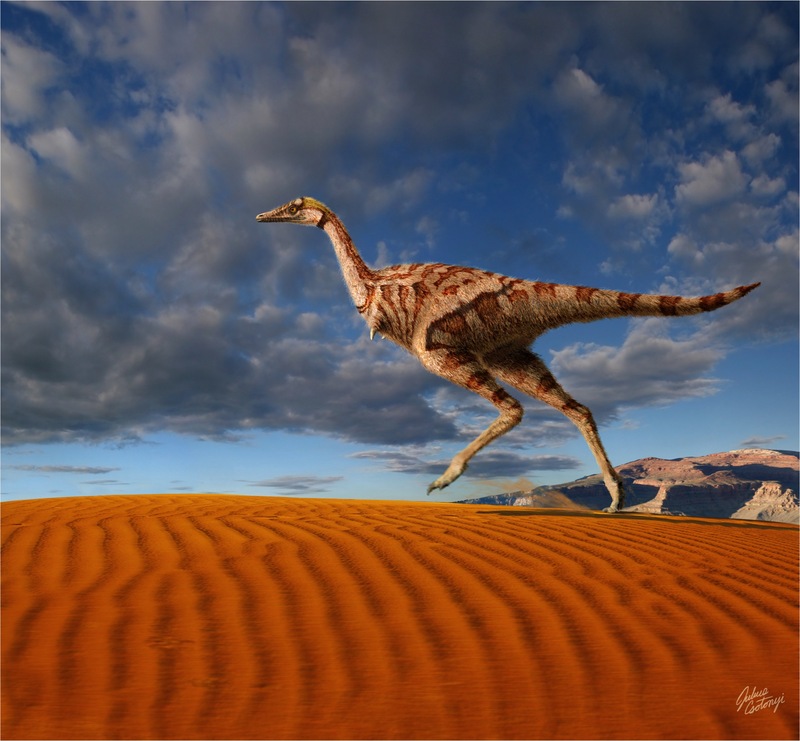 Many of you may have seen this already, but a new paper is out with what can only be described as a female pterosaur. 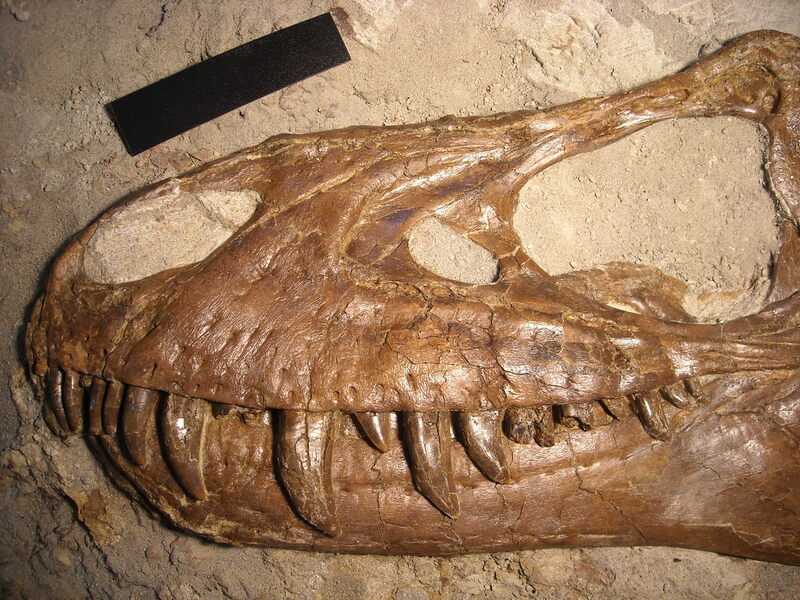 This is big news, while there have been suggestions in the literature (most notably about Pteranodon) about some specimens representing males or females, this is one rather more convincing than many for the simple reason that there is an egg associated with it. That it is another Darwinopterus and a great specimen too, only adds to the interest. 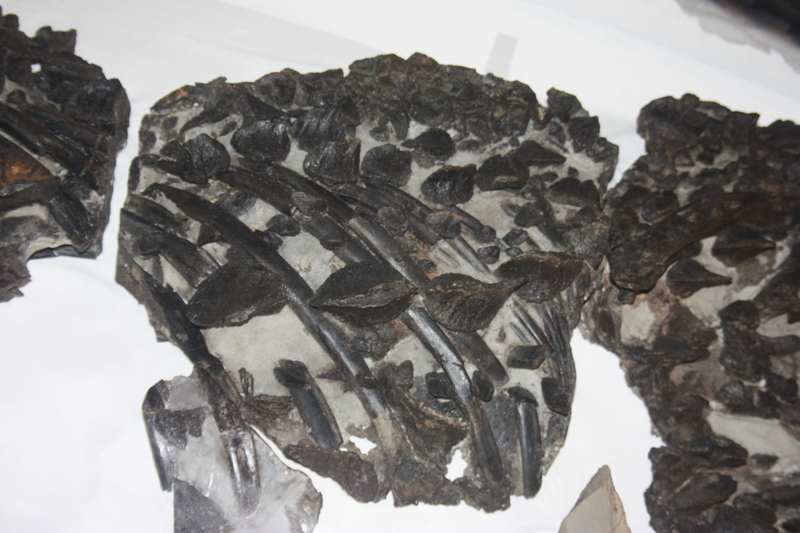 The egg, sadly, lacks any trace of an embryo (though this is perhaps not surprising as obviously the egg was only about to be laid, not about to hatch) but has all the characteristics of pterosaur eggs and is the right size and shape. It also lies between the legs of the female and just behind the pelvis. 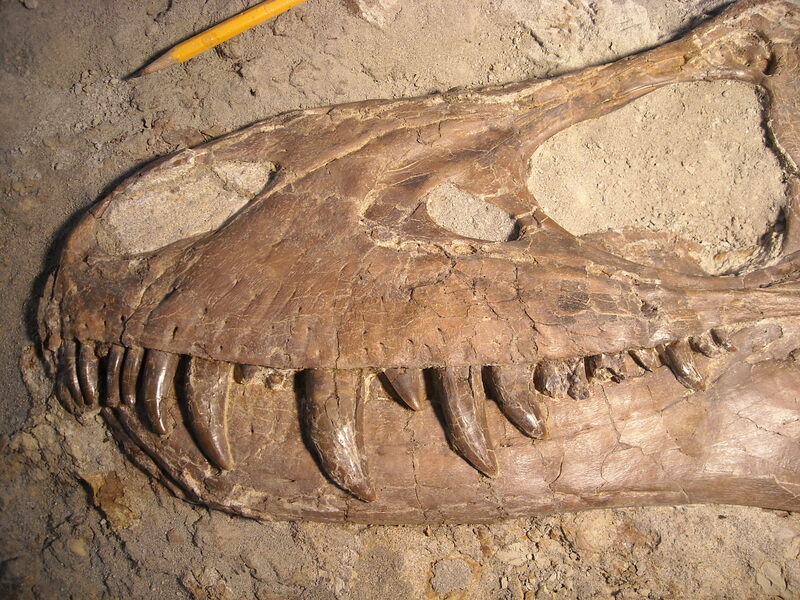 That it is not in the body is not a major issue – a similar situation is commonly seen with icthyosaurs for example where decomposition leads to bloating of the body and forces out anything large and solid like a late term embryo or as in this case, and egg that’s ready to be laid. Oddly enough the real interest in the paper lies in the head of the animal. 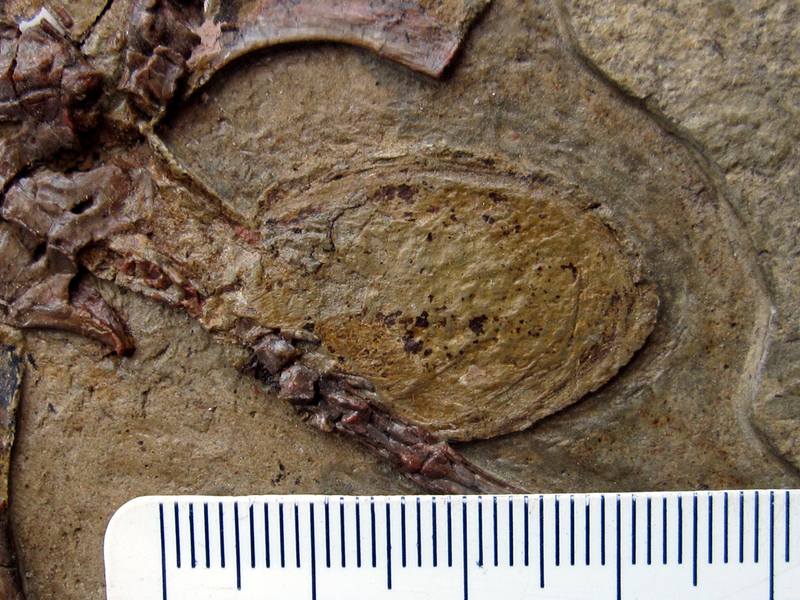 The egg clearly points to this being a female but the head has no trace of a crest, despite other specimens of Darwinopterus having one (as you can see here for example). The strong suggestion therefore is that Darwinopterus is sexually dimorphic with males having crests and females none. The authors make a pretty good case, though a hatful of other specimens with other consistent differences in something approaching a 50:50 split would be better still. One note of warning I would add though, is not to take this too far. Such extrapolation is fine for Darwinopterus, but I’d be very wary of taking the same basic criterion and applying it to other pterosaurs. Just as a quick example, many antelope and bovids have horns in males and females, and some can be nearly identical between the two, and in reindeer the females have antlers for parts of the year when males have none, while in most deer of course only males present antlers. 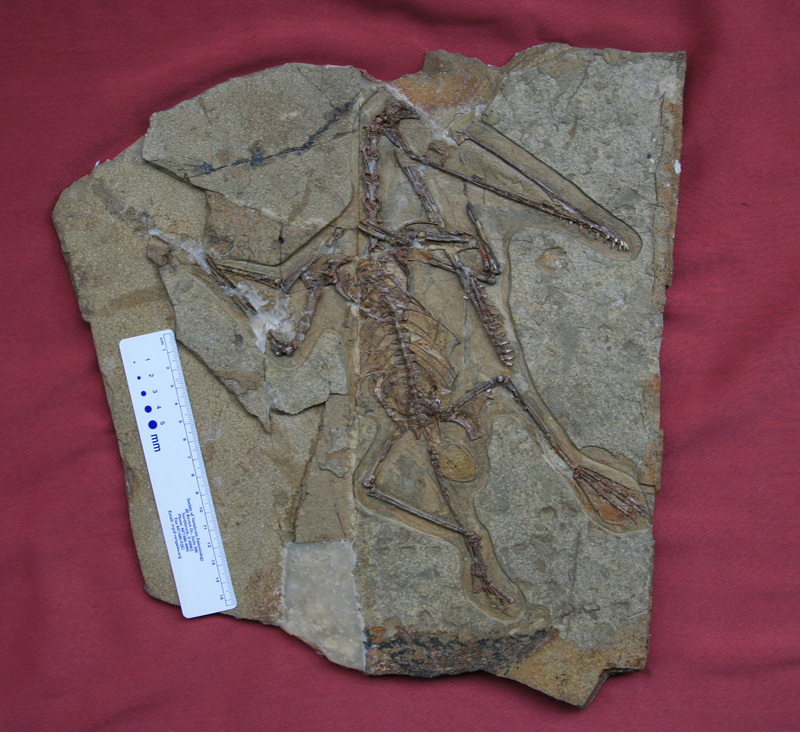 I suspect it’s a matter of days before we see the first crested pterosaur specimen = male (or no crest = female) blog posts or media reports but this would be, for me, a very big assumption too far. A great start yes, but not even the end of the beginning for pterosaur dimoprhism. Special thanks to Lu Jungchang for these special photos. The last of the preparation is now being done on the Gorgosaurus. Several bones were completed on January 19th. These were the first ones to be completely finished. The nature of the rock is cracked and crumbly and despite best efforts, some rock along the edges and underneath the bones has fallen away. 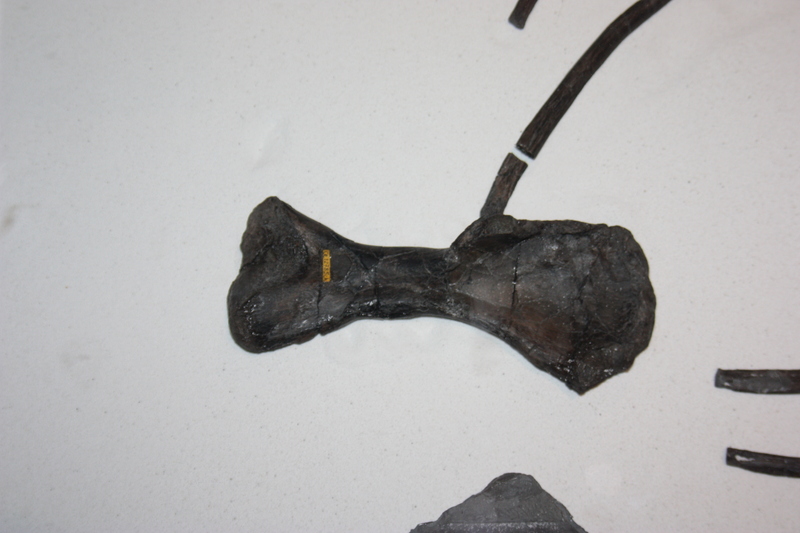 The bone is not properly supported and the missing rock needs to be replaced. The femur was badly affected this way. 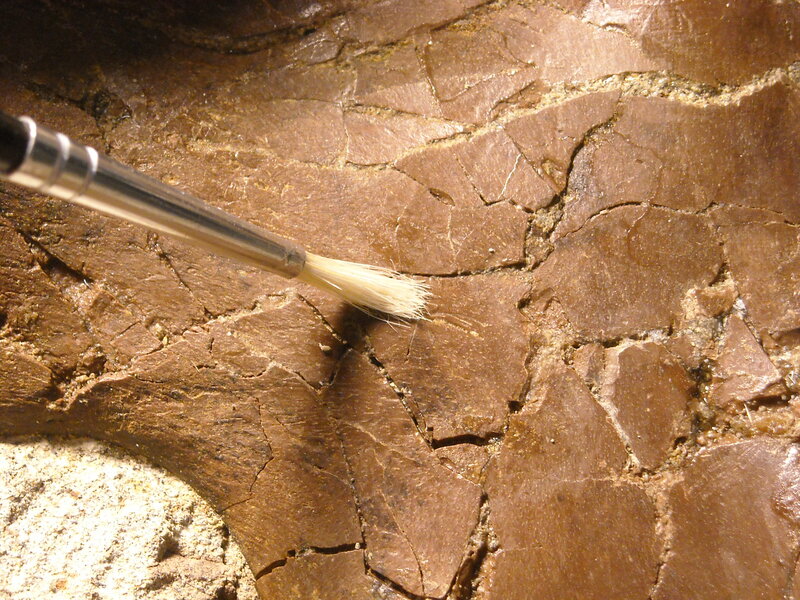 To remedy this (shown in a series of 4 pictures), I mixed some thick glue with sand from the Gorgosaurus block. Waste rock was broken up and ground into sand and dust, using a short length of a hardwood broom handle as a rolling pin. 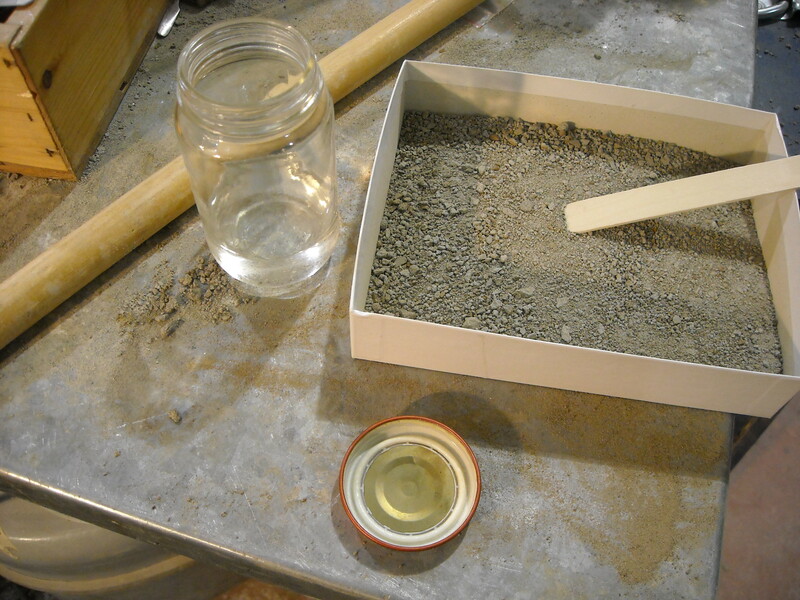 The resultant sand/dust was poured into the jar of glue and stirred together. 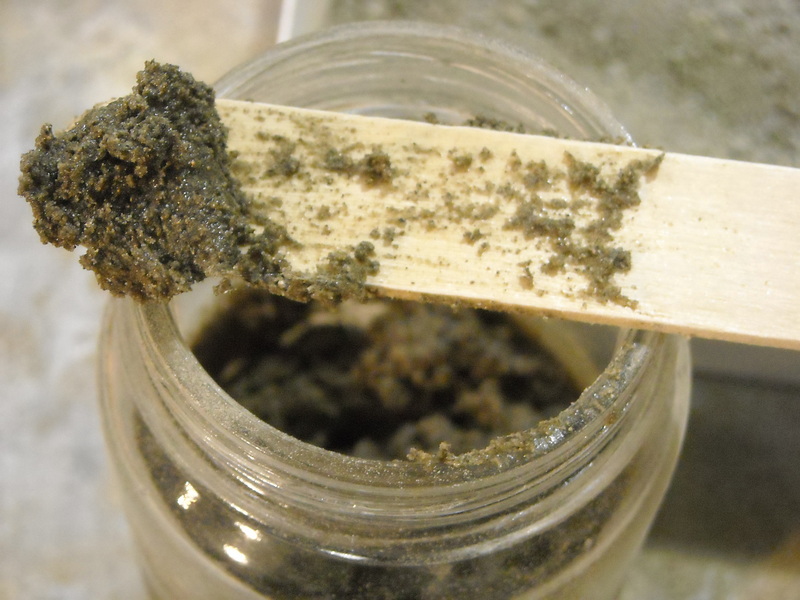 The result was a thick paste which could be made more runny by adding more glue, or thicker by adding more sand. This paste was applied to the undercuts using a small metal spatula. Because the paste was so thick, it was easy to work and retained its shape. It dried hard in a couple hours and the bone is now safely supported. The support can be removed in the future if need be by squirting acetone onto it and removing the resulting paste. Also, once the paste is hardened, it can be shaped with an airscribe if needed. The final result is quite convincing as “real rock”. The final treatment of the completed bones is a very thin coating of glue, made so thin that it does not sit on the bone surface, but soaks in. It seals up any remaining microcracks and dissolves and old glue on the surface. 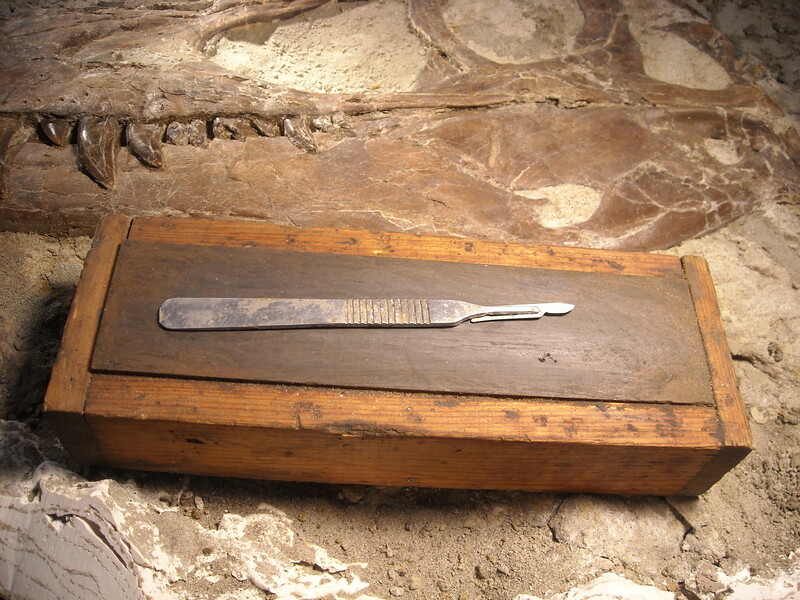 The provided picture with the brush shows part of the now fully prepared ischium, with the surface treatment of glue. Final preparation of the rest of the skull and skeleton will go quickly now. I’ve only just thought of this title and it’s obvious that this would have been a much better headline for yesterday’s post announcing my first proper foray into dinosaurs on TV. There I also muttered about the possibility of doing a post on the experience and this is that post. I had done odd snippets of TV in the past at various times and also a fair bit of radio and I’ve seen plenty of film crews around in museums so I think I have a reasonable handle on how things go. However, it can vary enormously depending on what the crew wants to film and how, how big the segment is likely to be and what background the researchers have got and how many people are there (I’ve seen crews form 5 to 15 people). About the only thing that is guaranteed is that it will take forever. My Discovery bit was all of about 7 minutes or so, and some of that was studio-based intro and voiceovers of still images. The actual film that was recorded runs for maybe 5 minutes. That took two 10 hour days to record, and all of that was done in one room. It was quite exhausting, not least because in the summer, Beijing tend to be sickeningly hot and humid. On top of that we were working in the basement. Where the water for the building is stored in an open tank. One of the biggest problems we had in terms of work was trying to stop sweat dripping onto the fossils. Really. Things can take a phenomenally long time and this is something I have seen may times with film crews. Either they are all extremely bad at estimating how long their work will take or they are very good at massive underestimates. We were told it might take as little as a day and that we would have lots of time to do our work (we were there to look at fossils, not to film) in the set-up times. In fact in the first day we did effectively nothing and in the second (which was not supposed to be needed, and even at the end of day one was supposed to be ‘just a couple of hours’) not much more. I assume this is a tactic to keep things moving but, and this is my only complaint (everyone was exceptionally polite, helpful, good natures, worked hard and turned out a great piece), they really sucked up valuable working time that they had repeatedly assured me would not be interrupted. As for being on camera, that really just takes a bit of preparation and confidence. Work out the questions in advance and plan your answers and how they’ll progress to make your points. Keep things simple and straightforward and try not to get bogged down in technical terms or get off topic. Oh yeah, and don’t panic. Coming soon, more Tarbosaurus and a new theropod.